63% of candidates believe job ads don’t provide enough information on company values and workplace culture. See how a Monster Branded Job Template can infuse your unique employer brand into your job ads. A sales representative will be in touch with you shortly to schedule a demo. If you would like to speak to somebody in the meantime, please call us directly at (866) 811-2458. 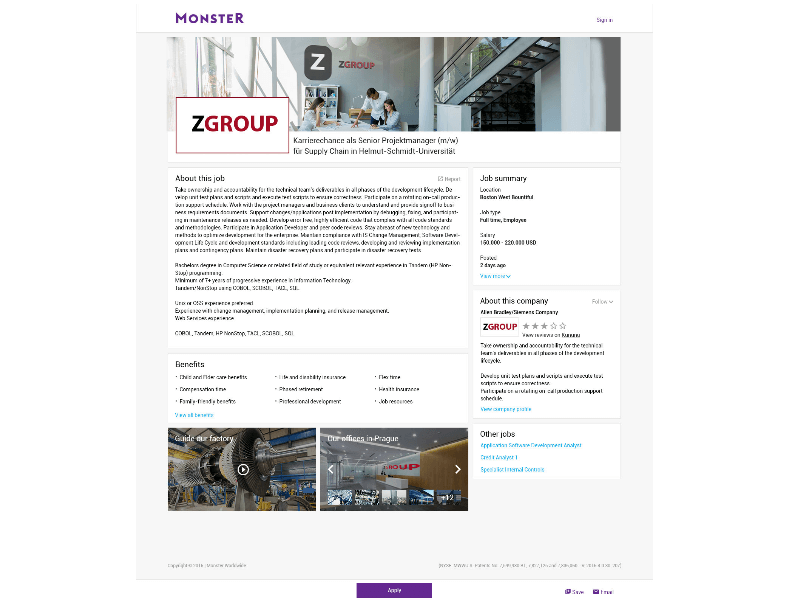 Because branding is a critical driver of applicant response, Monster has upgraded our Branded Job Templates to include more of the information that candidates want to see on job ads. So more potential employees who are the right fit can find your company as a natural part of their journey! Including unique elements such as photos, videos, social media links and of course, benefits – all on a mobile-friendly platform. More control over your brand with our new self-service model that allows for consistent messaging across your Job Ads. We leverage your colors, graphics and company logo to maintain brand consistency. Control your Job Ad look-and-feel by adding custom content that you probably already have on your career site such as photos, videos, social media links and more.. Additional templates can be made for other corporate divisions or brands. 58% of candidates believe corporate brand is the most important consideration when evaluating potential employers 2. Let users learn more about your company during the natural path in a candidate’s journey, helping you build your brand to recruit and retain outstanding talent. "Monster Enhanced Job Branding is something we have always used. It just presents our ads in a very professional manner."